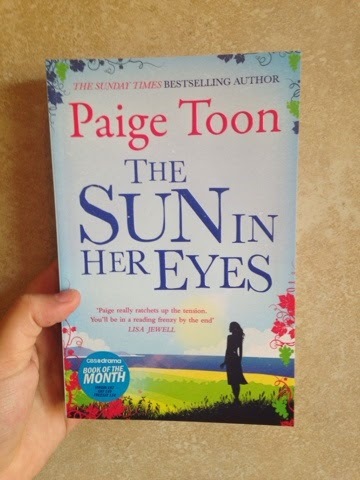 I am a self confessed addict when it comes to Paige Toon's books. I didn't even hesitate to pre-order her latest release and I couldn't contain my excitement when it landed on my doorstep the other morning. I am happy to report, that I wasn't let down. I gobbled it up in a matter of hours and I only wish that it had gone on longer. When Amber hears of her father having a stroke she finds herself with no reason not to fly over to Australia to see him. Having just been made redundant she finds herself on a plane, returning to the country she had grown up in, barely glancing back at the husband (Ned) she is leaving behind. Amber falls easily back into her old life, picking up where she left off with best friends Tina and Nell. Of course there is Ethan too, the subject of her childhood crush. He is newly divorced and Amber is faced with a moral dilemma as her loyalties to her husband dwindle. There was also a sub story of an elderly woman, Doris, who was witness to the car crash that killed Amber's mother when Amber was only three. Doris has held onto the last words Amber's mother said and she is on a quest to fulfil her promise to tell them to Amber. I really liked this idea and I only wish that it had been developed slightly more; not so much in how it ended but rather in how it developed. I also liked the flashbacks to the start of Amber and Ned's relationship which were vital to creating a believable relationship. With Amber fawning over Ethan, it would be easy for the reader to lose sight of her relationship with Ned but thankfully it was kept alive through these flashbacks. Amber was not my favourite of Paige's protagonists but I have learnt recently that I don't actually have to like a character to enjoy their presence. Amber certainly was flawed and she made some very questionable decisions but she was all the better for it. Of course, I fell for Ethan immediately, he was charming and charismatic. Again, not perfect, and I must say that I finished the book with a very different opinion of him than when I started it. The story line had just the right amount of twists and turns. Sometimes I felt as though I knew exactly how it was going to end but then Paige would throw a curve ball and I would be left wondering all over again. The ending was not what I expected but I wasn't disappointed. If you have read any of Paige's books before you will know that some characters pop up in more than one story. I found myself reading this book thinking about the stories that could be given to the more minor characters. In my head I formed different endings for all these characters and even the most minor ones suddenly held so much potential. The brilliance of Paige's storytelling is her ability to make the reader see more than just the main character. So, the big question: would I recommend it? Of course I would! It didn't quite knock Pictures of Lily off the top spot but it came pretty damn close!